Where are you most likely to see a UFO? More importantly, where are they most likely to see you? 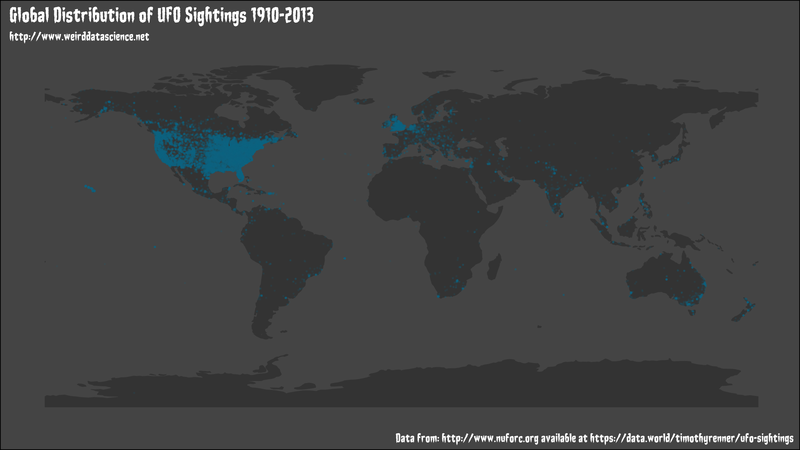 Thankfully, the National UFO Reporting Centre (NUFORC) have diligently compiled and curated a dataset of over a century of global UFO sightings. The data has been processed, cleaned, and uploaded by timothyrenner at data.world. What can we tell immediately? Firstly, there is a clear preference amongst UFO’s to descend on the United States, although Europe and in particular the United Kingdom receive their fair share of extraterrestrial visitations. The rest of the world is far from ignored, but our best hope of making contact would definitely seem to be in those two countries. We will be analysing this dataset in much greater detail in the future. How have these sightings changed over time? Are there patterns to be discovered in when and where UFOs choose to reveal themselves? Are these events predictable? As always, the answers lie in the data. You can keep up to date with our latest tinkerings with statistical reality on Twitter at @WeirdDataSci. # With the data appropriate projected for display, convert back to a data frame for ggplot2. # Display each sighting as geom_point. Use a level of transparency to highlight more common areas.